Creed, one of the most prominent post-grunge acts that have sold no less than 53 million albums worldwide, is Manila-bound. 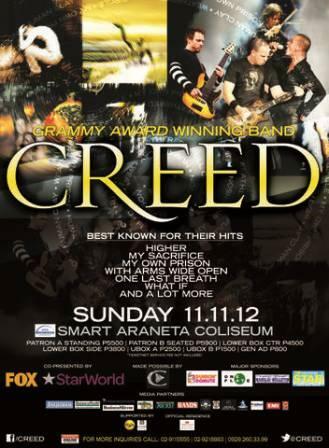 On Nov. 11 at the Smart Araneta Coliseum, lead vocalist Scott Stapp, bassist Brian Marshall, drummer Scott Phillips and guitarist/vocalist Mark Tremonti collectively known as Creed will perform live their well-loved songs that have endeared them to fans regardless of shifting trends in the worldwide music industry. Some of the most anticipated hits they racked up in their more than a decade of dominance are With Arms Wide Open, My Sacrifice, Higher, What If, What’s This Life For and Are You Ready. Note that Creed has its own greatest hits compilation album, one of the few from among its contemporaries. Of its hits, With Arms Wide Open has proven to be its biggest so far with the song eventually ending up as Best Rock Song in the 2011 Grammy Awards. The song about fatherhood that many believe has spiritual undertones, pushed the album to sell more than 10 million copies worldwide. It was also nominated in the Grammys under the Best Rock Performance by a Duo or Group with Vocal. The voice of Stapp is considered by many as one of the most compelling ones in the genre. In a review of one of Creed’s earliest performances, Stapp’s gravely but powerful voice was said to have the ability to energize a room as soon he steps up to the mic and it can fill up every available space. And though Creed has been involved in several controversies through the years — including going into hiatus only to return stronger than before — it has remarkably weathered all these through the sheer force of its musical artistry. By the time 2011 had come, the quartet has been hailed by Billboard magazine as the 18th best artist of the last decade. One of its albums that moved 40 million units worldwide also ended up as the ninth best-selling artist of the 2000s. But it’s not all nostalgia going for the concert in Manila. It is said that the band has started recording new material for its fifth album so it won’t be unlikely if it decides to sample some of these during the show, perhaps, even exclusively for its Filipino fans. Here’s interesting trivia about Creed: Though regarded by many as a Christian rock band due to some of its best songs focusing on themes such as eternity and faith, the band has never claimed to be one and, in fact, was never signed to a contemporary Christian music label. It’s just that unlike many other rock bands, Creed chooses to deal with such topics as sexual abuse, hostility and lucid dreaming “in a substantial, mature manner,” said a reviewer. Patron A Standing (P5,850); Patron B Standing (P4,500); Lower Box Center (P4,500); Lower Box Side (P3,500); Upper Box A (P2,500); and Upper Box B (P1,500); and General Admission (P800). For details, call 921-8883 or 0929-2603399. For VIP and Meet and Greet passes, call: 0929-2603399 or 02-921-8883.